omnomnomnom…mmmmm…*snorfle* what now? Oh yeah…we made these bad boys for a celebration we were having. Evil neighbours moved away, attention was paid, we rocked out like no one was listening on rockband, goodtimes. We felt it was a pub fare sort of night but we wanted it to have a little flair to it too. So we made these up with some goat cheese, which in my opinion is a god among cheeses…to put it mildly. They were goodly. Prick the potatoes with a fork and arrange on a baking sheet. Bake at 450F for 50 minutes. Crisp the bacon over medium heat until desired crispness. Remove from pan and drain on a paper towel. Allow to cool. Crumble the bacon into a bowl. Combine with the goat cheese and green onion. Fill each skin with a half teaspoon of the goat cheese mixture. Add more if you have enough leftover. Arrange the skins on a baking sheet and place under the broiler until the cheese is bubbly and the skins begin to crisp. Sometimes a spritz of baking spray on the skins will help those stubborn skins to brown if you are having problems. This makes 6 servings of two skins each. Each serving contains 85 calories, 2.9 grams of fat, and 1.2 grams of fibre. They are so full of flavour and were definitely the star of the celebration that night. So easy to do! 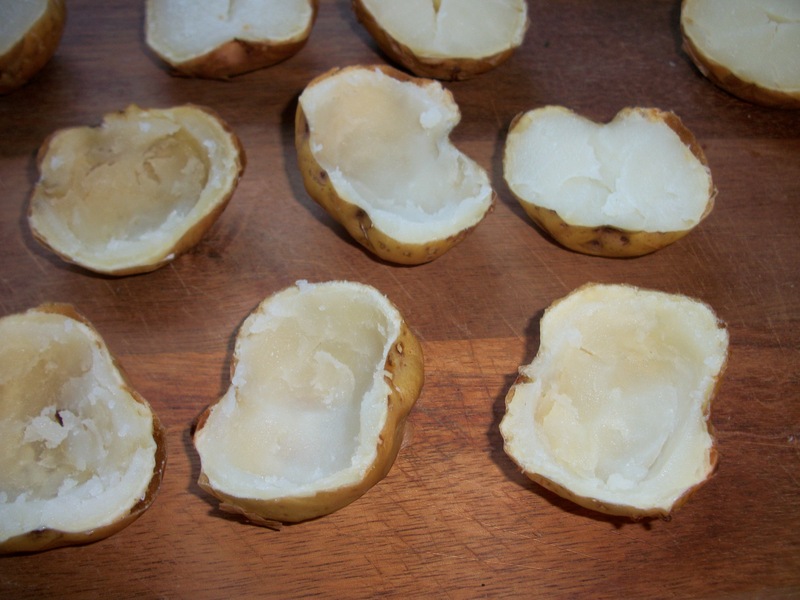 I just baked up the potatoes earlier in the day and assembled them later. Then shortly before we wanted to have them I popped them under the broiler and served! I love easy to prepare party foods. 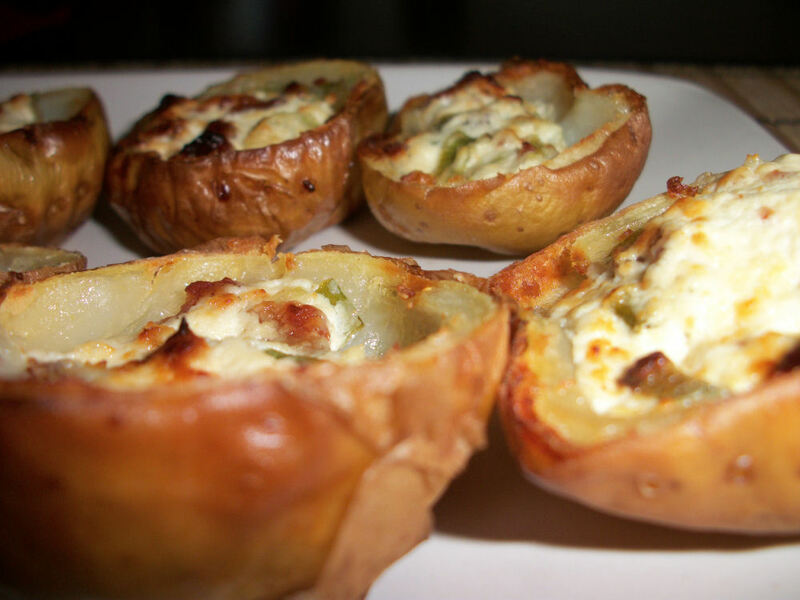 This entry was posted in Comfort Foods, Craving Buster, Sidedish, Snack and tagged bacon, Cheese, Potato. Bookmark the permalink.